with: John Patitucci - Adam Nussbaum - Ratko Zjaca - Stefano Bedetti. 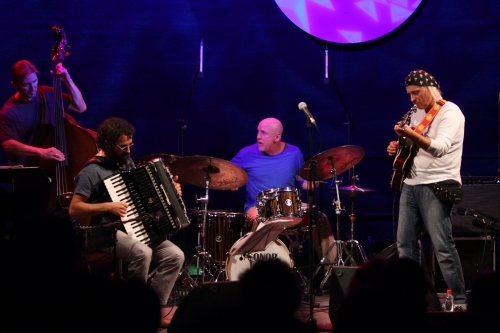 Why a tribute to Michael Brecker with an Accordion? For two main reasons: first because I love contemporary refined jazz and I consider Brecker one of its greatest exponents, and then because, at least to my knowledge, no accordionist has ever done a tribute to Michael Brecker. From the very beginning I struggle to liberate my instrument from the stylistic influence that I call "tanghite“ (tango-mania). I always struggle to be gripped by a musician who plays the accordion and not just an accordionist: two different things to my ears! This is the reason for the choice of a tribute to Michael Brecker, an artist who has made the modern language and the search for a harmoni-cally complex phrasing his musical philosophy. And then, to give further identity to the music, I wanted to engage a rhythm section that had played the stages of the world with this great artist, sharing his music and life experiences and contributing to the evolution of the modern jazz language. This is the reason for the choice of the great musicians John Patitucci and Adam Nussbaum. Adam, a longtime collaborator with Brecker from the first band in 1987, took part in many important albums like "Don’t Try This At Home“, "Now You See It" and others. The same for John, who also played on Michael‘s last two recordings: "Wide Angles“ and "Pilgrimage“. I wish to clarify, finally, that this is not a tribute to Michael Brecker in a philological sense, because the project is composed of only original compositions, often heavily contaminated by languages from other musical worlds such as free-jazz, contemporary classical music and a certain type of rock; in an attempt to keep alive musical freshness and a desire for inno-vation. SIMONE ZANCHINI JAZZ 4tet - "CASADEI SECONDO me"
Jazz tribute to the great musician SECONDO CASADEI, the most important Folk music' s composer in Italy. In general, I have never been interested in tributes, homages, or revivals. I've always thought of them as old, a bit pathetic and tied to the past. However, when I was asked to pay tribute to Secondo Casadei, I could not refuse. No, Casadei is another thing! Casadei represents my past as well as that of all the inhabitants of Romagna, and not just a musical past but of life in a general sense. If you were born in Romagna and decided, at the age of seven, to play the accordion, Casadei's music automatically becomes an obligatory phase that invades your life happily. Yes, I started and grew up with those sounds. And today I find myself honoured to be able to put my hand on the melodies composed by this great musician, in an attempt to give them a new twist and a more modern musical freshness, imbued with all the contaminations that have formed me through the long course of my studies, just like classical music and jazz. Top level international band that includes musicians from 4 differet countries. Original compositions. This ensemble possesses a unique and complete musical vision absorbing and reflecting the various musical styles of its members, while maintaining peaks of enviable individualism and the highest level of quality in music writing. The original pieces, written by Simone Zanchini and Ratko Zjaca, range from quiet intimacy to burning intensity. Different musical influences, including jazz, classical, world-music and free improvisation, compose and enhance this project made of original compositions. 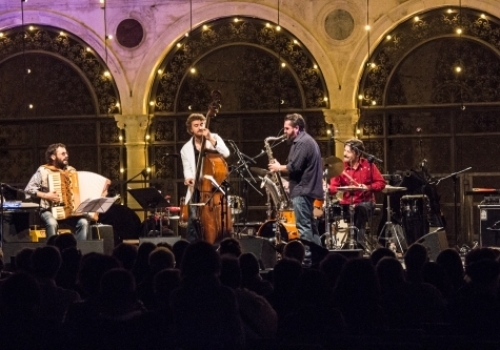 The pieces proposed dissolve the boundaries between written music and improvisation, creating unique soundscapes so deeply rooted in the history of music, and at the same time strongly pushed beyond the boundaries of modern music today. 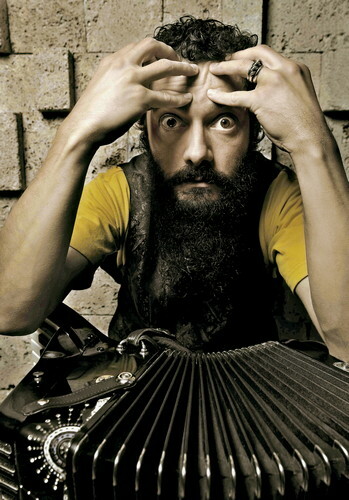 One of the most interesting and innovative accordion and guitar player in Europe. SALIS - ZANCHINI DUO "Free..!" 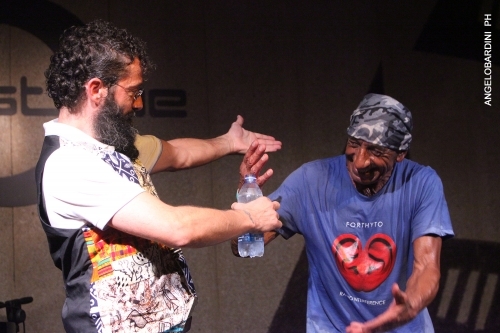 There was an encounter at the summit between the two “tightrope walkers” of the accordion and improvisational magicians as well as protagonists of the international jazz scene. Antonello Salis and Simone Zanchini are back together after ten years, to rejoice and experiment now as it was then, without boundaries and preconceptions. The possibility of continually exchanging roles, launched through free extemporaneous creations, allowed the two artists to fully enjoy the dynamic timbre of their respective instruments, enriched by the Antonello’s piano flights and refined electronic incursions of Simone and last but not least, by the authentic pleasure of the two friends having a tête-à-tête. "Antonello Salis is the only Italian accordion player (who is not really an accordionist...) with whom, I think it is worth improvising !" There was an encounter at the summit between these two great virtuosos and their instruments as protagonists of the international music scene. The musical intersection that distinguishes both allows them to express themselves easily from time to time in the world of jazz and classical music. With this duo, the spirit of the rhythms of South America and the pulsating depth of the old swing, mingle with the sounds of today's modern jazz, which is expressed in the compositional style of both. The eclecticism of the two musicians allowed them to wander and improvise in an extemporaneous manner with a very high communicative interplay, alternating original compositions with famous standards of the Latin-American repertoire. The great strength and sound of a soloist of the calibre of Gabriele Mirabassi, more than 30 years at the top among the best clarinettists in the world, is supported by the sonorous and creative magma of Simone Zanchini, considered one of the most original and innovative accordionists of the international scene. Simone Zanchini - accordion, electrocics, kazoo, toys. The research that Zanchini has been pursuing for many years adorns the accordion with an unusual and personal touch, where the timbre-expressive possibilities of the instrument are exalted beyond any kind or style. An accordion player among the most interesting and innovative on the international scene, he moves with the same mastery through classical music, contemporary, jazz and super-refined incursions. The solitary performance of Zanchini is developed on this boundary between the genres, a decidedly creative artistic experience, each time different and unpredictable. Moments of impromptu improvisation alternate original compositions by Zanchini himself and pieces by great composers such as George Gershwin, Charlie Parker, Duke Ellington, and Astor Piazzolla, all masterfully mixed by a continuous creative flow and improvisation, for about 70 minutes of music without interruption. A single Suite of about 70 minutes will accompany the listener on an exciting and unexpected musical journey, from the first to the last sound. Getting away from the code..this is the brave, pretentious and sometime risky purpose of this solo performans. "I have always been convinced that certain acoustic drones that dwell in our brains belong only to us, magnificently unique, transmissible only through the emotions of improvisation and perceptible only if armed with good "availability." We live in an era that seems to particularly need acknowledged and recognizable expressions and those I call reproducers of style. So there! ... this freeing oneself from the code is a courageous and sometimes risky attempt of this Solo. It is a work moreover expressed with the accordion, an instrument among the most connoted and strongly rooted in recognizable music." 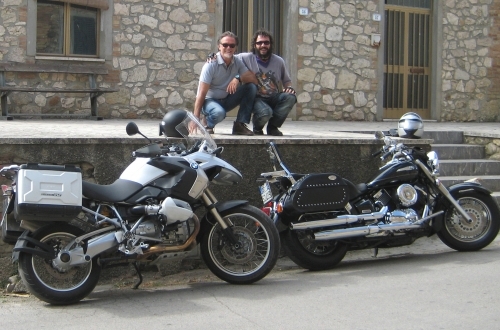 Stefano 'Cocco' Cantini - soprano sax, tenor sax / Bmw Gs 1200. Simone Zanchini - accordion, electronics / Kawasaki Vulcan 1600. The duo proposes an instrumental combination with very few precedents. The two artists started to work together, first as a quartet, then joined together to form a duo, sharing a passion for melody, research and motorcycles. The ability to continuously exchange roles and fully enjoy the timbre-dynamic possibilities of the respective instruments and their fascinating sound palette, allows this duo to involve both jazz lovers and classical music fans. 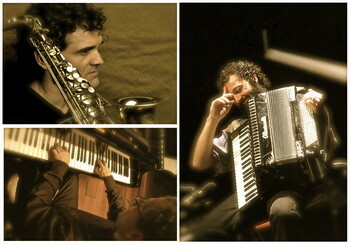 The repertoire, consisting of original compositions by the two musicians and songs of international standing, never loses the path of melody: great strength and success of a soloist such as Stefano Cocco Cantini, defined by Down Beat as one of the best and original soprano saxophones of the world scene, and Simone Zanchini, one of the most eclectic and talented accordionists of Europe. A tribute to my "guru" ART VAN DAMME. The Quintet reinterprets in a personal key one of the greatest exponents of the accordion jazz: Art Van Damme. The songs of the great musician, characterized by the sound created by the accordion-vibraphone combination, alternate between original compositions by Zanchini himself, who always respects the overseas language of mainstream-jazz that few know how to express with the accordion, especially in Europe. 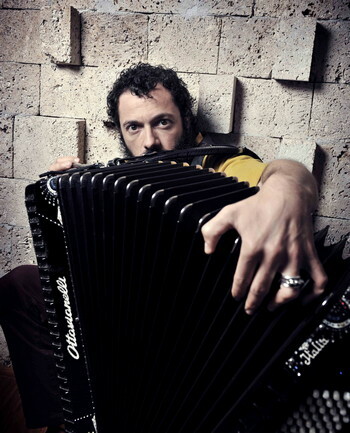 My congrats to you for showing what the accordion can sound like in jazz"
Simone Zanchini - Mario Marzi - Paolo Zannini. 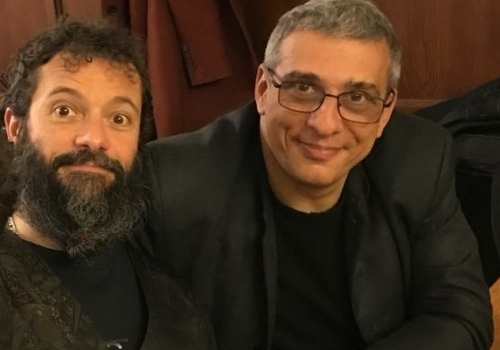 The group is made up of three musicians from “La Scala” theatre of Milano; It born desiring to play music of artists that, starting from popular and folk music, have found a new universal music language. The Trio present piece of great and famous south-American composers: E.Nazareth, E.Gismonti, H.Pascal, A.Piazzolla ecc.